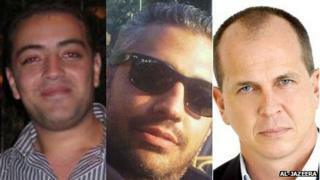 The US has called on Egypt to release three al-Jazeera journalists detained by the authorities in December. The arrest of the correspondents was "of deep concern" to Washington, White House spokesman Jay Carney said. The three reporters are Australia's Peter Greste, Mohammed Fahmy, a Canadian-Egyptian, and Egyptian national Baher Mohamed. They are accused of aiding "terrorists" from the banned Muslim Brotherhood - charges they deny. Al-Jazeera, the Qatar-based TV channel, has said the men were merely reporting the situation in Egypt. A number of journalists are currently facing charges in Egypt, amid concerns by rights groups that freedom of speech is being severely curtailed by the military-backed authorities. "The restrictions on freedom of expression in Egypt are a concern, and that includes the targeting of Egyptian and foreign journalists and academics simply for expressing their views," Mr Carney said on Tuesday. "These figures, regardless of affiliation, should be protected and permitted to do their jobs freely in Egypt. "We have strongly urged the government to drop these charges and release those journalists and academics who have been detained." The al-Jazeera reporters were arrested in late December following interior ministry accusations of illegally broadcasting from a hotel suite. Of the three arrested a month ago, Mr Greste, who had worked for the BBC, is accused of collaborating with "terrorists" by talking to Muslim Brotherhood members. Al-Jazeera Cairo bureau chief Mohammed Fahmy and producer Baher Mohamed are accused of the more serious offence of membership of the Brotherhood. The al-Jazeera network said it was "surprised" when its reporters were arrested. Two more of its staff - journalist Abdullah Elshamy and cameraman Mohammad Badr - were arrested in July and August. Other news organisations, including the BBC, Sky and the Daily Telegraph newspaper have issued a joint call for the immediate release of all journalists held in Egypt. One count puts the number at more than 40.